Design-wise, Golden Flame has two types of outdoor heaters on its catalogue. One follows a pyramid style, and the other adopts a circular base. In this review, we give you a summary of consumer feedback on the latter. As advertised, it’s the XL-Series with a 46,000 BTU heat output and a matte-mocha exterior. Is it worth it? What are its pros and cons? Let’s give you some answers in this Golden Flame 46,000 BTU (XL-Series) two-tone heater review. 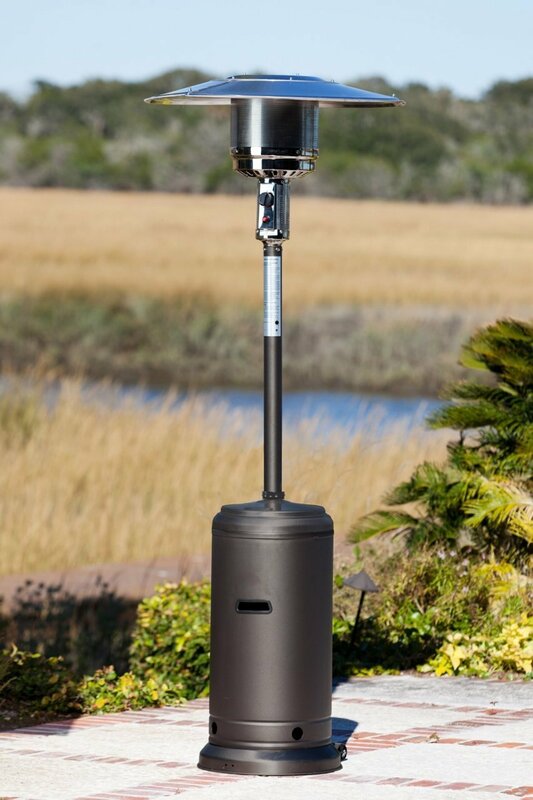 First, expect a freestanding outdoor heater with a height of 89 inches (or more than 7 feet). On its side are two wheels that help with mobility. Tip it gently, and then easily pull the unit to another place. As previously mentioned, this Golden Flame outdoor heater is not the pyramid type. The base is a circular tube that helps with stability by letting you add 30 lbs. of sand. If in case this unit gets accidentally tipped over, know that there’s a Tilt-Switch that immediately shuts the unit off when this happens. It has an output of 46,000 BTUs. To compare how hot this is, know that one stove propane burner can produce 11,000 BTUs. Tired of the manual push-button igniter? According to Golden Flame, the XL-Series has an easy-press and easy-start Rapid-Spark ignition system. – Assembly. There is some assembly involved, but based on general feedback, it should be easy to do. – Heat Output. As an outdoor heater, the heat radius depends on the weather condition. If it’s windy, expect a lesser radius. But as what consumers have noticed, the Golden Flame HLDS01-GTHG puts out a great amount of heat within 4 to 5 feet. – Quality. Overall, the unit is sturdy. However, some of the parts may not be as sturdy as the rest. For instance, one person noticed that the cap of their Golden Flame unit started warping because of the heat after only 3 uses. – Appearance. Many previous buyers are pleased with how nice this patio heater looks. – Other Uses. Aside from being a heating device, this can also be used for “ambiance” purposes. The Golden Flame HLDS01-GTHG puts out a great amount of heat. But aside from helping you combat with the cold, this outdoor heater can also be used to set a nice ambiance. This is especially useful if you’re planning a chilly but romantic date with your special someone.